Matthew Goodheart: Bracken Tongues Wept / for piano with autonomous viola and metal percussion. 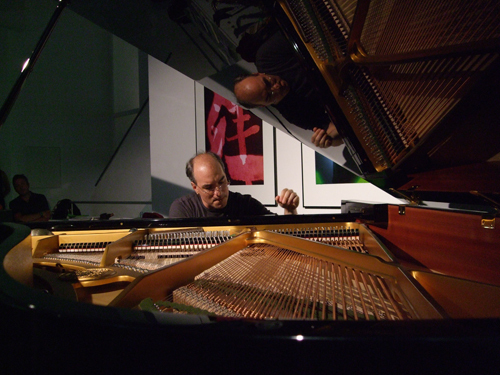 Created especially for Art’s Birthday, this work combines Goodheart’s unique extended piano techniques with his explorations into re-embodied sound. Using metal percussion and viola controlled via computer, the work moves through algorithmic and improvisational sound spaces, hovering between performance piece and sound installation. A native San Franciscan, Matthew Goodheart has gained an international reputation as an improviser, composer, and sound artist. Following an early career as a free-jazz pianist, he has created a wide spectrum of often unusual sounds that explore the relationships among performer, instrument, and listener. His work ranges from large-scale microtonal compositions to open improvisations and immersive sound installations – all unified by the analytic techniques and performative methodologies he has developed to bring forth the unique and subtle acoustic properties of individual musical instruments. Goodheart’s approach results in a “generative foundation” for exploring issues of perception, technology, cultural ritual, and the psycho-physical impact of acoustic phenomena. His work has been featured throughout the US, Canada, and Europe in such festivals as the the International Spectral Music Festival, June in Buffalo, Klappsthulfest, Jazz Ao Centro, The Illuminations New Music & Arts Festival, and many others. He has performed and recorded with such luminaries as Wadada Leo Smith, Fred Frith, Pauline Oliveros, Glenn Spearman, Gianni Gebbia, Vladimir Tarasov, and Jack Wright, and works frequently with the new music ensemble sfSoundGroup. He has won numerous awards, and is presently a Fulbright scholar in Prague, writing new music for the quartertone pianos created for Alois Hába in the 1920s. In the Spring of 2014 he will be a Fellow at the American Academy in Berlin on the 2014 Berlin Prize in Music Composition.